It is early summer in the Maritime Provinces in Canada and across the continent in Alaska. Great swarms of beautiful orange and black monarch butterflies have just arrived in these areas after a 2000 mile flight from warm, southern climates. These are the very same butterflies that had	migrated south the previous fall. The milkweed plant grows in large numbers in these areas. It is the only food that the young of the butterflies (not yet born) can eat. The female wastes no time, but flits about depositing eggs on the underside of the leaves of this plant. Using a cement from her own body, she attaches only one egg to each leaf. Tiny caterpillars, about one-eighth inch long, hatch out in less than week. They first eat the egg shell from which they have come, and then they eat nothing but milkweed leaves. After about two weeks they have grown to their full size of about two inches. These caterpillars are not at all pretty like their parents. They have a skin with unusual coloration of yellow, black and green stripes. 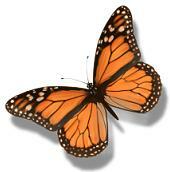 The monarch's Creator didn't intend them to remain ugly and destructive. After reaching full size each caterpillar produces a tough silken thread from its mouth which it anchors under a leaf or twig, and then suspends itself. At this time its final layer of skin peels off, and its exposed body soon hardens in the air, providing a pretty, smooth waxy, green covering. Wrapped in this it changes into a pupa. During the next twelve days a great change takes place. Finally, what is inside works its way out. And can you guess what appears? The ugly caterpillar has changed into a beautiful butterfly, wings pressed tightly against its sides, but complete in every way. At once it climbs up on a leaf to rest an hour or more while its wings expand and harden. Suddenly, without the help of any lessons or trial flights, it spreads its wings and flies away, a fully-grown, mature butterfly. From now on it spends its time feeding on nectar. When the weather gets cooler each butterfly, along with hundreds of thousands more, will leave everything behind for the winter, migrating to southern climates. The Lord often has object lessons for us in His creation. The unattractive caterpillar reminds us that our lives begin with no purpose except to be "fulfilling the desires of the flesh and of the mind." Ephesians 2:3. Following these desires we always try to satisfy our appetites with the food of this world. But when God's love reaches our hearts we learn that by accepting Christ as our Saviour we are transformed, as "a new creature," now able to reckon ourselves "to be dead indeed unto sin, but alive unto God through Jesus Christ our Lord." Romans 6:11. The butterfly, transformed from an ugly caterpillar, has a new appetite for what is sweet. And the believer's appetite should be for the Word of God, which is indeed "sweeter than honey."